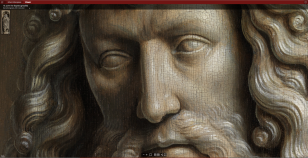 Since the launch of the website Closer to Van Eyck in 2012, devoted to the Ghent Altarpiece by the Brothers Van Eyck, it had yet to receive major updates. The panels and frames of the closed altarpiece were treated between 2012 and 2016. The conservation work led to the discovery that around 70% of the original paint layers of the Van Eycks had been hidden beneath overpaint for centuries, requiring removal. The altarpiece was painstakingly recorded at every step of the conservation process through state-of-the-art photographic and scientific documentation. Visitors to the site can now adjust a timeline to view key moments in the conservation process, and have access to simultaneous viewing of images before, during, and after conservation. Users can zoom in even closer on details of the painting, exploring microscopic views of the work in 100 billion pixels.